The Allen Lambert Galleria and Heritage Square was constructed after an invited design competition in 1987. 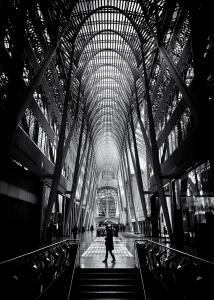 The atrium is a six story high pedestrian thoroughfare that connects Bay St to the west and Yonge St to the east in the Toronto Canada financial district and is frequently used as a showcase for major photography and art exhibits. Original photography from 2015 using a Canon EOS 60D body with a Sigma 17-70mm f2.8 DC Macro OS lens. Reprocessed using Silver EFEX Pro as a Lightroom plugin for the Black and White conversion.